The Green Bean Coffee Co provide a welcoming and relaxed environment to enjoy a delicious coffee and a cake with friends. The Green Bean serves it's own special blend of coffee and home baked cakes to the people of Penzance. The coffee, which is sourced from central Latin America, is a blend of 100% arabica beans (the tasty ones) ensuring a full flavour and aromatic coffee every time. The café has a relaxed, informal atmosphere, and is open Monday to Saturday from 9am to 8pm, 10 to 6 on Sundays. 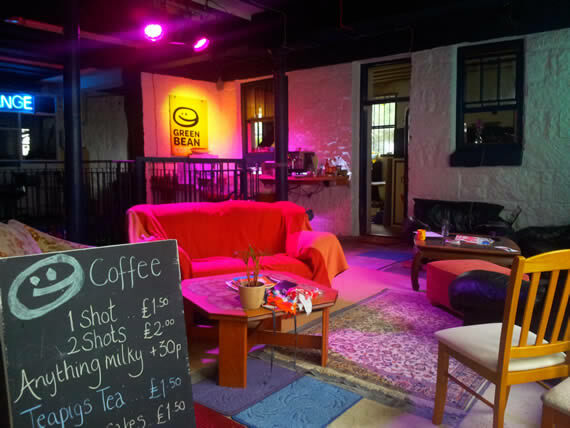 Drop in and enjoy a cuppa, some Creative Commons licenced music and free wifi.